MORE INFO: Reservations are NOT required. Meet at 3:00 pm at Hobe Sound National Wildlife Refuge beach on the north end of Jupiter Island. 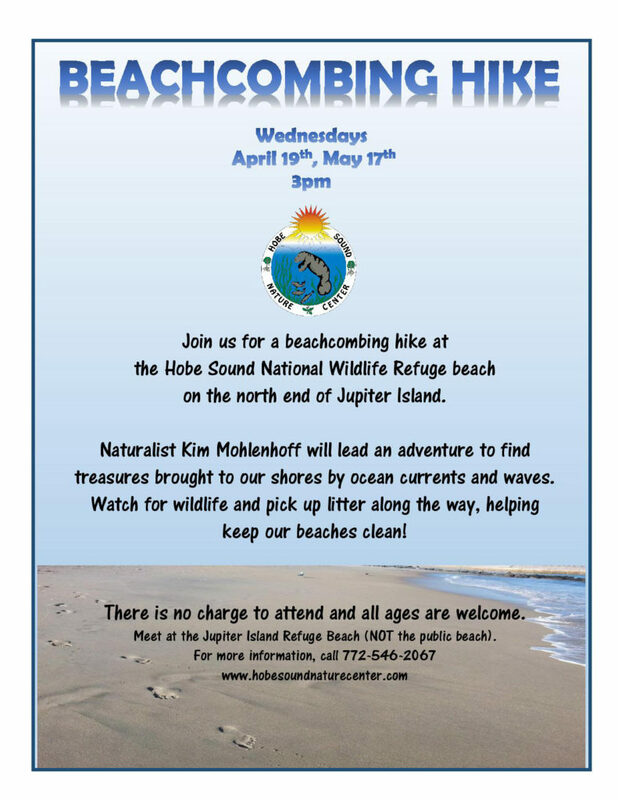 The Hobe Sound National Wildlife Refuge and Nature Center invites you to join Nature Center naturalist Kim Mohlenhoff for a hike at the Hobe Sound National Wildlife Refuge beach on the north end of Jupiter Island. Kim will lead you on a beachcombing adventure to find treasures brought to our shores by ocean currents and waves. Watch for wildlife and pick up litter along the way, helping keep our beaches clean! 3:00 pm at Hobe Sound National Wildlife Refuge beach on the north end of Jupiter Island.